September, and spring alongside, is certainly in full swing and shaping up to be a busy one. My calendar is filled with quite a few engagements, including long overdue catch ups with friends and summer product launches for work. I am by no means complaining, but rather loving the buzz that spring seems to create every year. No doubt, warm weather and increasing sun light are making a busy schedule much more bearable as well. I love having a few stand-by recipes in my kitchen repertoire for when I'm a little pressed with time. A favourite salad that can be thrown together at the last minute or quicker than quick home-made bread can save from a lot of unnecessary stress. Forward planning is of course the key, but I tend to rely on recipes that can either be made ahead or use basic ingredients that I am likely to have in my kitchen at all times. 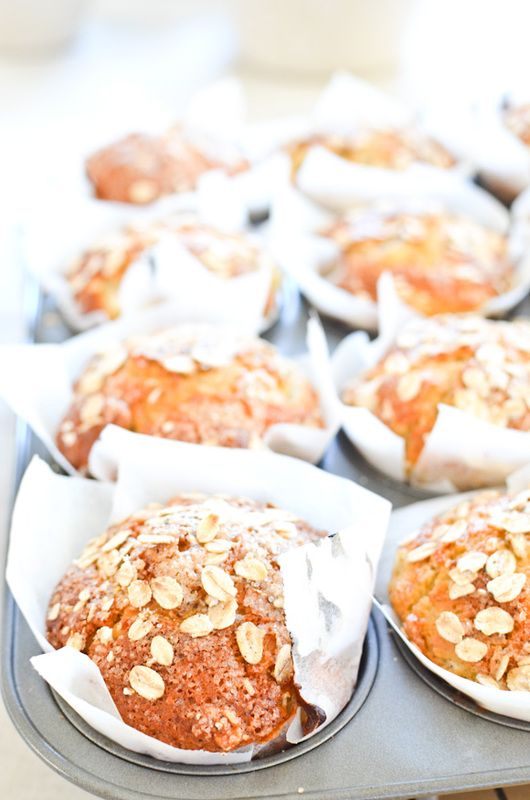 These apple and oat muffins tick all those boxes and are perfect to bring along to a brunch with friends or serve with afternoon tea. Yoghurt gives them a sour edge that is balanced with sweet vanilla. Feel free to add a couple of teaspoons of ground cinnamon too, if you like. 1. 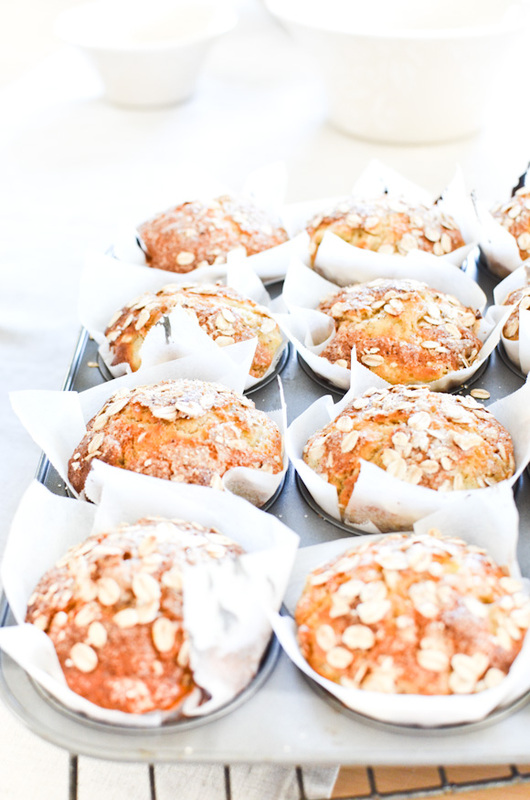 Preheat the oven to 180C and prepare a 12-cup muffin tin. 2. Mix flour, baking powder, baking soda, oats and sugar together. 3. Whisk yoghurt, eggs and oil in a separate bowl. 4. Add egg mixture to the dry ingredients and fold with a large spoon to combine. Add apple. 5. Spoon the batter in to the cups and sprinkle with left-over oats and vanilla sugar. Bake for about 25 minutes or until a tester inserted in the middle of a muffin comes out clean. Leave to cool on a wire rack before serving. Excellent - I've been looking for a good muffin recipe. Thanks. Those are lovely muffins! I love the topping. I am drooling over these! 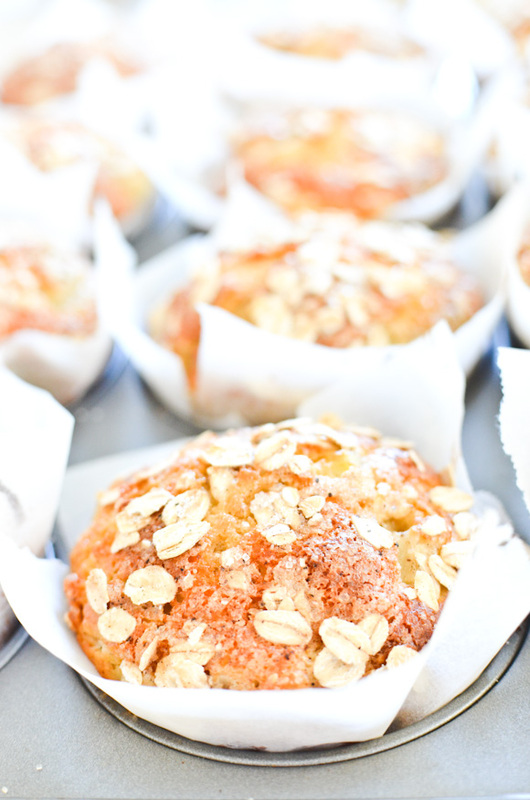 I could go for a nice apple muffin today. What a beautiful photos! And I'm definitley craving muffins right now..
Those muffin tops just look so crunchy and tasty! I've never made muffins. Maybe I should start with these. These look gorgeous, healthy and perfect for this season. The smell of baked apple really is fall to me! Such delightfully ethereal photos! And what a recipe - definitely worth of the pictures Yum! What beautiful photos! I wish I had one of these for breakfast right now! They look fantastic. I am trying these immediately. Thanks for sharing. Made these today and they were delicious! My toddlers loved them too. So glad to hear that, thank you Rachel!